Trevor Young have worked in public relations and communications for over 20 years. Joining the industry after five years as a journalist in country Victoria, he proceeded to work with some of Australia’s biggest consulting firms including Professional Public Relations (PPR), The Rowland Company and Porter Novelli. In 1998 he co-founded Spark Communications Group with Richard Chapman, a former colleague from Porter Novelli. With its focus on strategic marketing and communications, Spark quickly developed a reputation as a creative PR hot-shop working for major brands such as Cadbury Schweppes, Ford, Foster’s, Coles, NAB, FlyBuys, ANZ Bank and the Australian Made Campaign. Within a couple of years Spark had launched a brand experience marketing company called Ignition Marketing as well as established an office in Sydney. At its peak, Spark employed some 25 people full-time and up to 50 casual staff in Ignition’s ‘Street Team’ promotional division. Spark was acquired by Australia’s biggest media buying firm, Mitchell & Partners, in 2006. In 2009, Trevor co-founded a boutique communications advisory firm called parkyoung in partnership with former senior corporate affairs executive, David Park. Eighteen months later parkyoung merged with the Melbourne office of Edelman, the world’s largest independent public relations firm. KEYNOTE SPEAKER: a passionate and experienced professional speaker available for keynote presentations to large audiences or facilitation of workshops and training sessions across the areas of social media, content marketing and personal branding. CONSULTANT & ADVISER: offers project-based consulting services to forward-thinking companies and organisations large, medium and small; as a rule these organisations tend to be progressive in their thinking (and actions) and are excited to be involved in social media and and the online content creation process. PERSONAL MENTOR FOR INDIVIDUALS: Mentors (on a selective basis) creative entrepreneurs, authors, business leaders and professionals to develop their platform and build their personal brand. WRITER: Writes a blog called PR Warrior plus contributes regularly to Smart Company, the MYOB Pulse blog and Firebrand Talent’s Ideas Ignition blog. He is also the author of the book ‘microDOMINATION: How to leverage social media and content marketing to build a mini-business empire around your personal brand’, published by John Wiley & Sons. How does he manage and find time to do podcasting? How to start a blog, or a podcast and get attractions? What’s the Reputation Revolution podcasting journey like and how it arrived so far? What does he managed to achieve in starting a podcast? 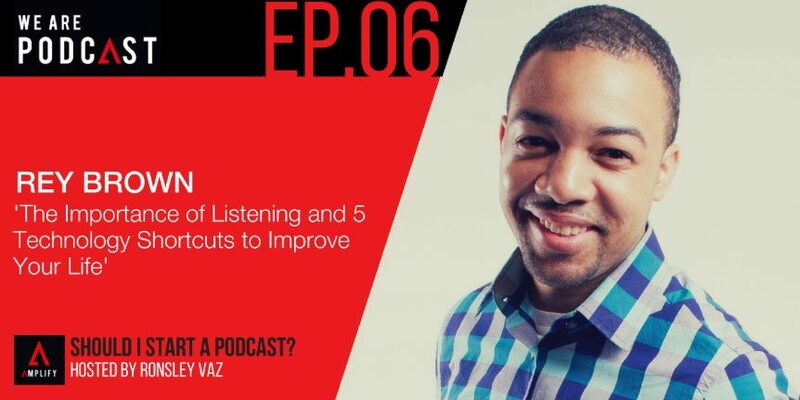 Why podcasting is hot right now? What’s coming on the podcast going forward?